Aerodynamics is the study of air flow over airplanes, cars, and other objects. Airplanes fly because of the way in which air flows over their wings and around their bodies, so a knowledge of aerodynamics is crucial to the design and construction of airplanes. The efficiency with which automobiles use fuel is also a function of air flow. Even stationary objects are affected by aerodynamics. Winds blowing past a tall building, for example, may cause windows to pop out if they are not properly designed and installed. Four properties of air affect the way in which it flows past an object: viscosity, density, compressibility, and temperature. Viscosity is the resistance of a fluid to flow. Molasses is very viscous because is flows slowly, while water is less viscous because it flows readily. The viscosity of air is important in aerodynamics because air tends to stick to any surface over which it flows, slowing down the motion of the air. The density and compressibility of air are important factors at high speeds. As an object travels rapidly through air, it causes air to become compressed and more dense. As a result, other properties of air then change. The effects of temperature change on air flow also become important at high speeds. A regular commercial airplane, after landing, will feel cool to the touch. But the Concorde jet, which flies at twice the speed of sound, will feel hotter than boiling water. Air can travel over a surface following patterns of flow referred to as either laminar or turbulent. In laminar or streamlined flow, air moves with the same speed in the same direction at all times. The flow appears to be smooth and regular. Bernoulli's principle applies during laminar flow. Bernoulli's principle states that a fluid (such as air) traveling over the surface of an object exerts less pressure than if the fluid were still. Airplanes fly because of Bernoulli's principle. When an airplane takes off, air rushes over the top surface of its wing, reducing pressure on the upper surface of the wing. Normal pressure below the wing pushes the wing upward, carrying the airplane upward along with it. Turbulent flow is chaotic and unpredictable. It consists of irregular eddies (circular currents) of air that push on a surface in unexpected ways. The bumpy ride you may have experienced on a commercial airplane could have resulted from the development of turbulent flow over the airplane's wings. Drag is any force that tends to prevent an object from moving forward. One source of drag in airplanes and automobiles is skin friction. As air passes over the surface of either vehicle, friction between air and surface tends to slow the plane or automobile down. One of the goals of transportation engineers is to find a shape that has the least amount of skin friction, thus reducing the amount of drag on the vehicle. Sleek, tear-drop-shaped cars became popular in the middle to late 1990s because they had so little skin friction. Engineers also work to reduce pressure drag. Pressure drag is caused by abrupt changes in the shape of a car or airplane. The point at which the roof of a car ends, as an example, is a point of high pressure drag. A car designed with a smooth transition from roof to trunk will have less pressure drag and, therefore, will travel more smoothly. Airfoil: The cross section of an airplane wing parallel to (or running in the same direction as) the length of the plane. Angle of attack: The angle that the length of the airfoil forms with an oncoming airstream. Camber: The additional curvature of the upper surface of the airfoil relative to the lower surface. Induced drag: Also known as drag due to lift; the drag on the airplane due to vortices (whirling patterns of air) on the wingtips. Stall: A sudden loss of lift on the airplane wing when the angle of attack increases beyond a certain value. Supersonic speed: A speed greater than that of sound. An airfoil is a two-dimensional cross section of the wing of an airplane as viewed from the side. Engineers seek to design airfoils that will have the greatest amount of lift and the least amount of drag. One factor important in the design of an airfoil is the curvature, or camber, of the upper side of the wing. The greater the camber, the faster air moves over the upper surface and the greater the lift to the wing. The amount of camber in a wing is changed by means of flaps and slats in the wing that produce different amounts of lift during take-off, cruise, and landing. Another factor affecting lift is the angle of attack: the position of the wing in comparison to the ground. As the forward edge of the wing is tipped downward, the amount of lift on the wing is increased. Increasing the angle of attack too much, however, may result in a sudden loss of lift, causing the airplane to lose all lift and go into a stall. 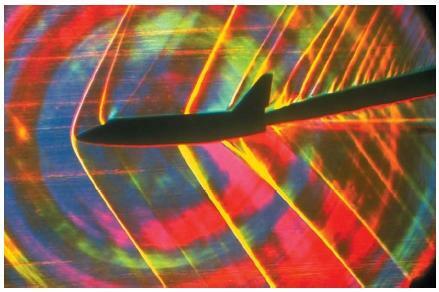 Air movement around an airplane wing can also cause drag effects. At the very tip of the wing, air traveling above and below the wing meet and produce whirlpool-like patterns known as vortices. These vortices tend to pull the wing downward, thus producing drag forces on the wing. These forces are known as induced drag. What do jet airplanes and a baseball pitcher's curveball have in common? They both depend on Bernoulli's principle for their operation. Bernoulli's principle states that the faster a fluid (such as air or water) flows over a surface, the less pressure the fluid exerts on that surface. In the case of the jet airplane, air travels faster over the top of the wing than across the bottom of the wing. Since the pressure on top of the wing is reduced, the airplane is pushed upward. A pitcher can cause a baseball to curve by making it spin. On one side of the ball, air carried along by the spinning ball rushes past in the same direction the ball is traveling. On the other side of the ball, air is pushed in the opposite direction. On the side of the ball where air is traveling faster, pressure is reduced. Higher air pressure on the opposite side of the ball pushes it out of a straight path, causing it to curve. Aerodynamics is applied to other problems of air flight as well. Airplanes have tendencies to rotate in one of three directions: in a horizontal back-and-forth motion around the center of the airplane, in a front-over-back motion, or in a rolling fashion, wing-over-wing. Special controls must be developed to prevent loss of control in any of these directions, any one of which could cause the airplane to crash. Ailerons (pronounced AYL-uh-ronz) are one such control. They prevent a rolling action by increasing the lift on one wing while decreasing it on the other. Flight at speeds greater than that of sound present special problems for engineers. One reason is the importance of the compressibility of air at these speeds. Sound waves produced by an aircraft moving through the air travel more slowly than the aircraft itself. This produces a shock wave characterized by an abrupt change in temperature, pressure, and density that causes a steep increase in the drag and loss of stability of the aircraft. The loud sonic boom one hears is the wave hitting Earth's surface. The need to overcome the effects of shock waves has been a major problem for engineers. Swept-back wings are one way of reducing the effects of shock. The delta or triangular wings of the supersonic Concorde and several military airplanes are another solution. The most advanced airplane designs actually call for the complete retraction of the wings during the fastest part of a flight, converting them into a rocket for part of the trip. It's a nice site, informative and easy to digest. I came here in search of turbulant flows, and enjoyed reading about Bernoulli's Principle. I was previously unaware of the different types of drag such as pressure drag and induced drag. Hello, I am a student of a aviation school and I am interested about the idea of a friction free airskin. Both the advantages and the disadvantages of such a compund, or in my mind a wave which could deflect air particals. Does this sound possible? Could you please give me some of your personal insight. Thank you for any and all help, Joseh Higginbotham. I am trying to understand if an object travelling on a surface will experience differences in drag due to heat waves flowing up from that surfaces. will an object experience a positive/negative/unknown/or no effect in drag due to heat waves from a surface it travells on? So will aerodynamic principles change under this condition that would warrant a change in the design of the object in motion.